…The crystal-clear water of the lakes contained many blooming lotus flowers of different colors like blue, yellow, white and red, and the saffron powder from the lotus flowers was blown all around by the breeze. All the lakes were full of beautiful swans, ducks and cranes, crying occasionally with melodious sounds. 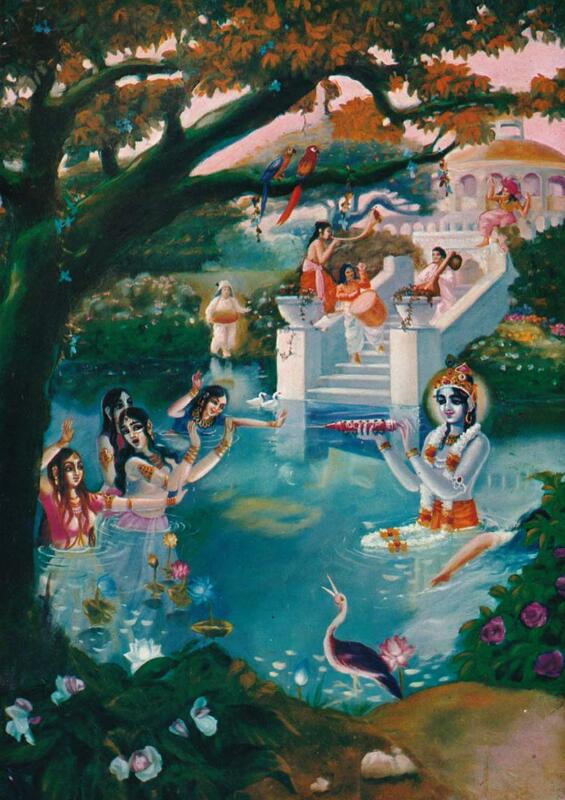 Lord Śrī Kṛṣṇa sometimes entered those lakes, or sometimes the rivers, with His wives and enjoyed swimming pastimes with them in full jubilation. Sometimes the wives of Lord Kṛṣṇa, who were all goddesses of fortune, would embrace the Lord in the midst of the water while swimming or taking bath, and the red vermilion of kuṅkuma decorating the beauty of their breasts would adorn the chest of the Lord with a reddish color. 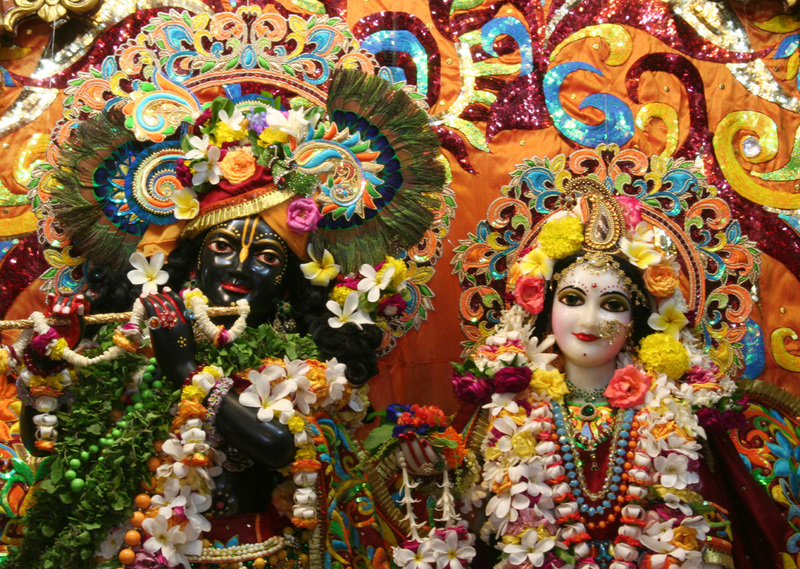 The impersonalists would not dare believe that in the spiritual world there are such varieties of enjoyment, but in order to demonstrate the factual, ever-blissful enjoyment in the spiritual world, Lord Kṛṣṇa descended on this planet and showed that the spiritual world is not devoid of such pleasurable facilities of life. The only difference is that in the spiritual world such facilities are eternal, never-ending occurrences, whereas in the material world they are simply impermanent perverted reflections. When Lord Kṛṣṇa was engaged in such enjoyment, the Gandharvas and professional musicians would glorify Him with melodious musical concerts, accompanied by mṛdaṅgas, drums, kettledrums, stringed instruments and brass bugles, and the whole atmosphere would change into a greatly festive celebration. In a festive mood, the wives of the Lord would sometimes sprinkle water on the Lord’s body with a syringe-like instrument, and the Lord would similarly wet the bodies of the queens. It is late at night and I was searching for some late night reading…The Teachings of Lord Caitanya was there on the shelf, so I opened it and began to read the Introduction. 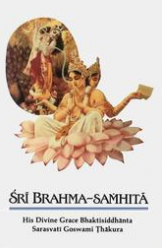 The Introduction was originally delivered by Srila Prabhupada as five morning lectures on Caitanya-caritāmṛta before the International Society for Krishna Consciousness, New York City, April 10–14, 1967. This is the conclusion of the Introduction and proved to be a good choice for late night reading and an early morning post. Kṛṣṇadāsa Kavirāja Gosvāmī petitions the blessings of Lord Gopīnātha: “May that Gopīnātha, the master of the gopīs, Kṛṣṇa, bless you. May you become blessed by Gopīnātha.” The author of the Caitanya-caritāmṛta prays that just as Kṛṣṇa attracted the gopīs by the sweet sound of His flute, He will also attract the reader’s mind by His transcendental vibration. …Govinda resides eternally in Vṛndāvana. In the spiritual world of Vṛndāvana the buildings are made of touchstone, the cows are known as surabhi cows, givers of abundant milk, and the trees are known as wish-fulfilling trees, for they yield whatever one desires. 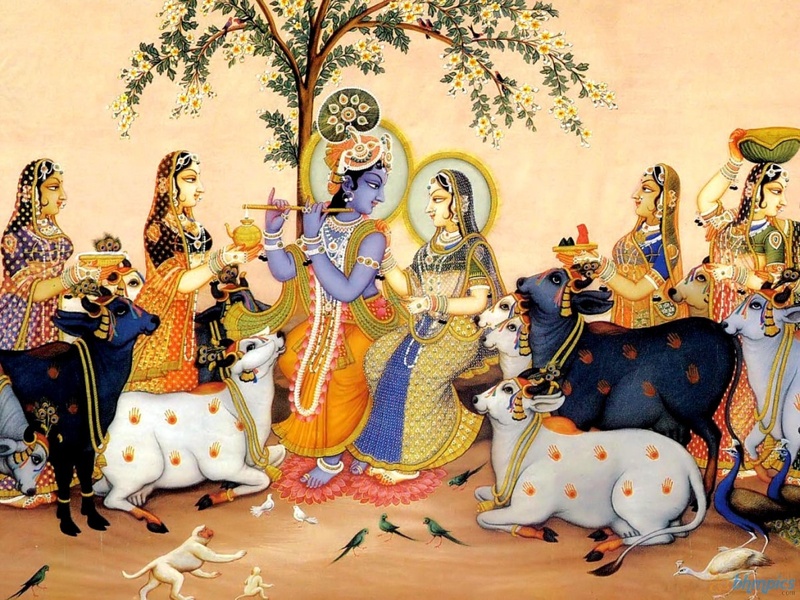 In Vṛndāvana, Kṛṣṇa herds the surabhi cows, and He is worshiped by hundreds and thousands of gopīs, cowherd girls, who are all goddesses of fortune. When Kṛṣṇa descends to the material world, this same Vṛndāvana descends, just as an entourage accompanies an important personage. Because when Kṛṣṇa comes His land also comes, Vṛndāvana is not considered to exist in the material world. Therefore devotees take shelter of the Vṛndāvana in India, for it is considered to be a replica of the original Vṛndāvana. Although one may complain that no kalpa-vṛkṣa, wish-fulfilling trees, exist there, when the Gosvāmīs were there, kalpa-vṛkṣa were present. It is not that one can simply go to such a tree and make demands; one must first become a devotee. The Gosvāmīs would live under a tree for one night only, and the trees would satisfy all their desires. For the common man this may all seem very wonderful, but as one makes progress in devotional service, all this can be realized. Sometimes when I am sitting and reading from Srila Prabhupada’s Srimad Bhagavatam, a verse or sentence from the purport just jumps out from the page almost like it is in 3D, and I catch a glimpse of what the Spiritual World must be like. It is beyond even my imagination, but sometimes I catch a glimmer of light, through a transcendental window, by the grace of my spiritual master His Divine Grace A. C. Bhaktivedanta Swami Prabhupada. …The transcendental abode of the Lord where the trees are all desire trees and the buildings are made of touchstone. 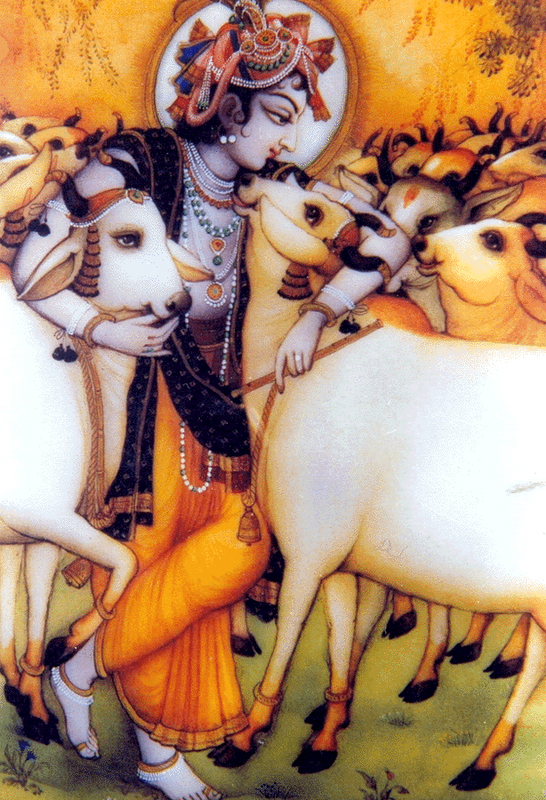 The Lord Govinda is engaged there in herding the surabhi cows as His natural occupation. …And those who are artists, overtaken by the beautiful creation, should better see to the beautiful face of the Lord for complete satisfaction. The face of the Lord is the embodiment of beauty. What they call beautiful nature is but His smile, and what they call the sweet songs of the birds are but specimens of the whispering voice of the Lord.